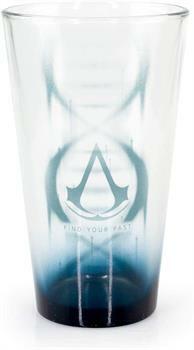 Show off your love of Assassin's Creed with this officially licensed pint glass! Clear pint glass holds approximately 16 ounces and features the Assassin insignia along with the text "History is in your blood". Sure to make a great gift for your favorite Assassin's Creed fan! Not dishwasher or microwave safe. Hand wash only. Show off your love of Assassin's Creed with this officially licensed pint glass! Clear pint glass features the Assassin insignia along with the text "History is in your blood".